Strohmeyer & Arpe are a wholesale grocery export and import company. 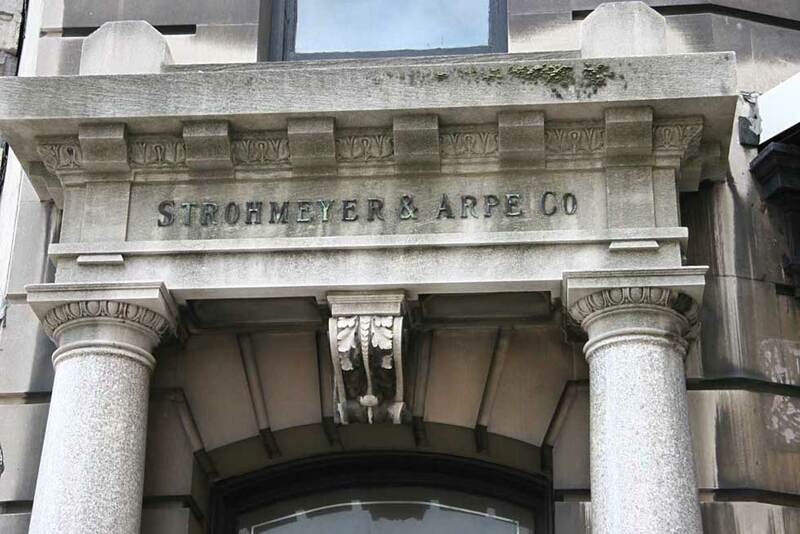 The company began as F. G. Strohmeyer & Co. around 1883 at 55 Pine St. in New York City. Strohmeyer was Frederick Gottfried Strohmeyer (1852-1931). He was born in Bremen, Germany, 20 Feb. 1852, and immigrated to the U. S. in 1878. Arpe was Herman Arpe (1855-1926). His passport application in 1902 stated that he was born in Aumund, Province of Hannover, Germany, 3 April 1855, and that he immigrated to the U. S. in 1871. He seems to have been employed at F. G. Strohmeyer from the beginning of the business, and had his name included in the firm name around 1895. The building at 139-141 Franklin St., New York City, is a 10-story brick and stone warehouse and office building constructed by Strohmeyer & Arpe for its own use in 1909. Their sign in copper letters over the entrance likely dates from the building's original construction. This image dated 1939 from the New York Public Library's Digital Collections shows Strohmeyer & Arpe signs on the building's east wall overlooking Varick St. Products advertised are Re Umberto Olive Oil and Marie Elisabeth Sardines. The Strohmeyer and Arpe slogan reads, "Importers of the world's pure food products." I photographed this wall many times from 2001 to 2009. Initially it was almost impossible to read anything. Then words and images began to bleed through. The words "pure / olive / the best" began to appear. Some of these can be read in this detail from 2009. There seems to be considerable overpainting. Is that Re Umberto in the oval? The company occupied this building from 1909 to 1967/68. In the mid-1970s they moved to Milburn, New Jersey. Strohmeyer & Arpe are still in business (as of Feb. 2009), and are now located in Short Hills, New Jersey. Their web site is www.strohmeyer.com. They continue to deal in wax and honey, which were two of the products that were featured in their listing in Trow's New York City Directory in 1891: "Fish, Honey, Wax."